:The Jeremiah 29:11 Bible Study Kit comes in blue LuxLeather with a gold pattern and â€œHope & A Futureâ€ sentiment on the front cover. Keeping all their essentials together is easy with the slip pockets. The study kit includes a study notebook, highlighter, and assorted micro pens, which are great features and helpful tools for deeper study and reading of the Word. 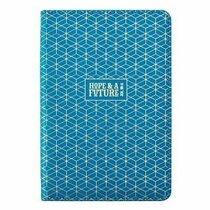 About "Bible Study Kits: Hope & a Future, Blue/White Patter Luxleather Folder"